Impatient with PCOS: I think, no. I really don't think I've been seeing anything of any importance these last couple days. It's just barely there and I have to hold it at an angle and it isn't getting any darker. Seems to me like is should be getting darker if it was for real. And today I saw it again and decided that it was time to get a second opinion from the FRER. I used my last analog FRER from February. The FRER was totally negative. The FRER get's the final word today. Hey, but I did finally get a picture of the ghost. Here can't you see it? No? Maybe at this angle. Still having trouble, let's tilt it a little more. Ok, fine, I will help you out. For the record, an HPT should NEVER be read like this. They were never intended to be held at this angle. 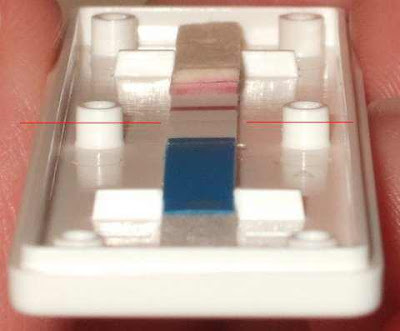 I think it's an evap line or just the antibody strip. I can see it straight on in the right conditions, but it's just too light to be real. No more testing till Thursday if I can help it. Update on my P4: 23.2. Meh. Very good for me and a single ovulation, I was hoping for something just a little higher for two follicles though. *By the way, these pictures have NOT been enhanced at all. Mmm, I DID see it before you pointed it out. I am not testing till Friday. Or I could use the same test that "worked" last month. White pants and a shirt that only comes to hip level. Since CD 28 I have been wearing Dark Pants Only. It's not over till it's over babe. I'm not sure about the dollar tree tests. I remember those lines too. But mine never appeared till after I quit looking at it, threw it away and walked away. Then, next time I was near and would glance down, I saw the glimpse. They were always gray. Crazy I know. I saw the line though before you pointed it out. Its not over yet. I'm still really hopeful for you. That is an awesome number! I hate FRER. I know they are supposed to be the most sensitive, but even when they are positive, the lines have always been so faint for me that they drive me crazy wondering if something is there. It is still very early. I'm still really hopeful for you too! It is still so early -- don't give up yet! I have been told by my nurses that even definitely pregnant people often get negative HPTs. They're just not great at detection, esp this early...which leads me back to my question: Why, oh why, have they not yet figured out how to make a reliable, early pg test? I have no idea (never seen a line), but I hope you get a very definite positive very soon!!!! oh I can see a line that does not even exist!!! I think I have stared at thousands of test, taken them in the sunlight put in front of bright lights to see-- oh gosh it is buned in my heart and memories--- ((hugs)) hope you get it soon! Thanks for this, yep, I think it's a no-go for me. I pretty much had to do that too.